I had a few requests for instructions on how to make the gathered round basket that I made last week. This is an easy project and the baskets can be made in any size, are fully reversible, and are useful for so many things. 1. Fuse the wadding to the fabric circle that will form the outside of the basket, following manufacturers directions. 2. Baste the basket lining and basket outer together with the wrong sides facing. 3. 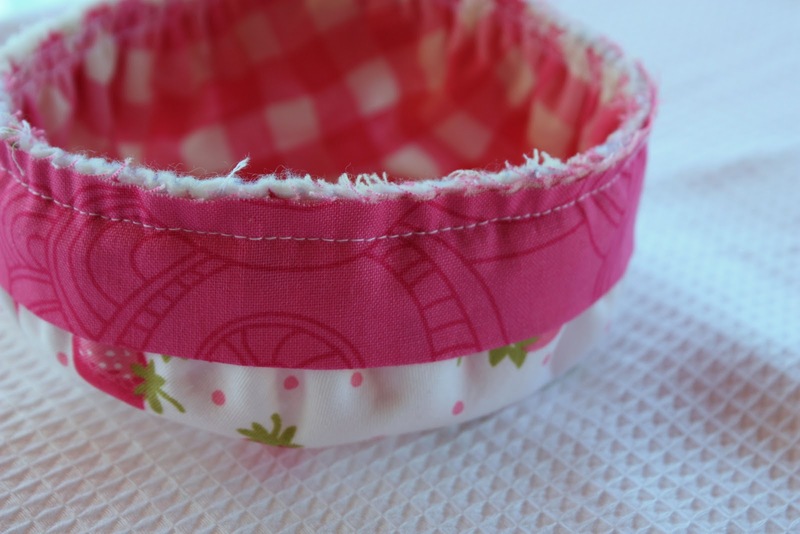 Using a long straight stitch, sew a gathering stitch around the perimeter of the circle, close to the edge. Stitch a second gathering stitch close to the first gathering stitch. Ensure both gathering stitches are within the 1/4 inch seam allowance. 4. Gently pull the two ends of thread on the wrong side, the fabric will gather along the thread. 5. Secure the threads at one end to prevent the stitches from pulling out. 6. Even out the gathers until the circumference of the circle measures approximately 12 inches. When all the gathers are in place, use a standard machine stitch to stitch a 1/4 inch seam. 7. Press the binding strip in half lengthwise with the wrong sides facing. 8. Pin the binding to the outside of the basket and stitch in place. 9. 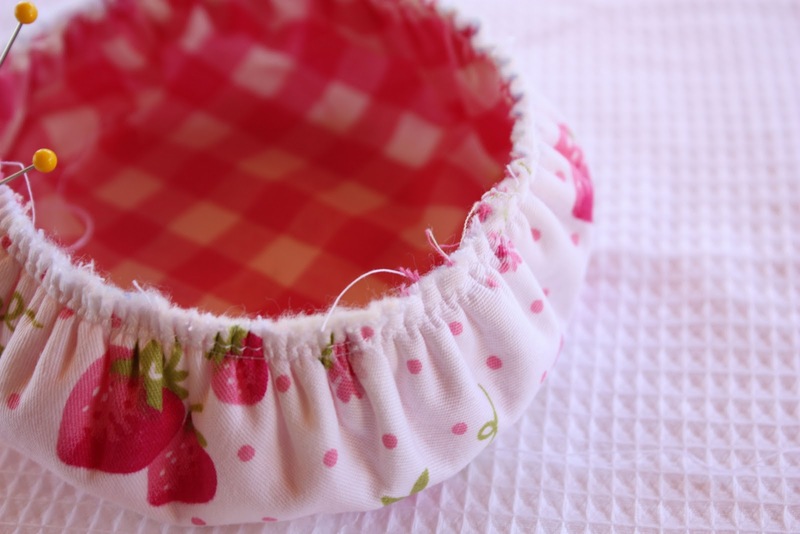 Fold the binding over to the inside of the basket and stitch in place by hand using a slip stitch to secure. Edit 07/ 2012 – Just wanted to clarify in response to a few emails – The circles are 8 inches in diameter (the measurement you get if you rule a line through the centre of the circle) and when they are gathered they measure 12 inches in circumference (i.e all around the outside of the circle). Check out Gathered Round Basket – 3 Sizes, to make three baskets that nest inside each other. Signing up to our monthly newsletter is a great way to keep up to date on some of our most popular posts each month, and it also includes free (newsletter exclusive) projects. Wow, GREAT tutorial! I love the basket! I placed a link to your tutorial under my “Inspirational Projects” section on my blog sidebar … it’s officially on my To Do list! Thanks for the tutorial, Lisa! And the new header is beautiful! Thanks for the tutorial I will have a go at making this one too. Lovely fabric, very pretty and great header – I wouldn’t know where to start. Я всегда не любила пришивать круглое дно . 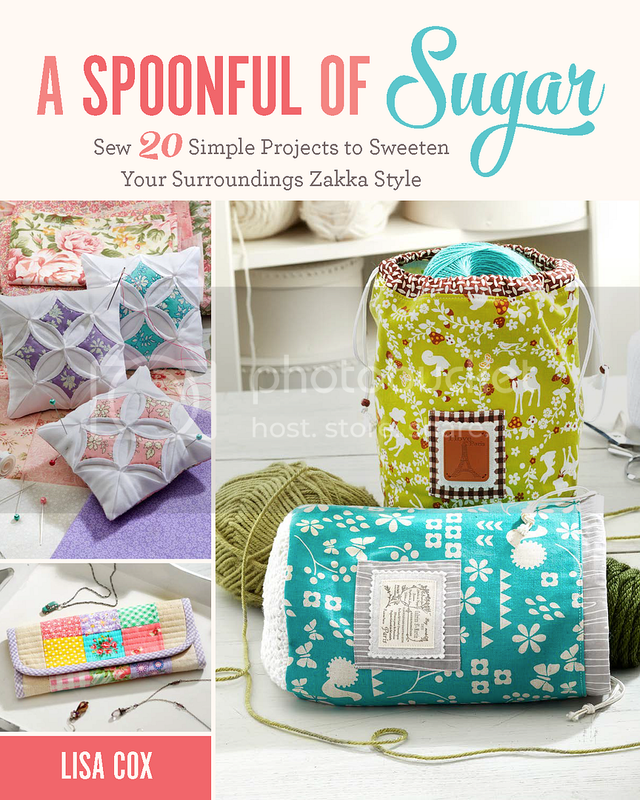 I am going to make one of those cute baskets for sure – thanks for the knowhow! The banner is great but now I think that Paris is in Australia!? 😀 But I know how you feel – I love it too! GORGEOUS!!! Makes a great present. And then I ask myself why present. Why not one for me??? Thanks Lisa, i am going to give this a go, i have been itching to use some of my Pure by Sweetwater and this looks perfect. Sarah is a young lady with many talents. I was hoping you would post a tutorial. Cutest little holder I’ve ever seen! Thank you! Thank you for the tutorial Lisa, such a cute and quick project! Sweet strawberry basket. Yes, great new header!!! very nicely done…what a great tutorial. thanks! Nice tutorial. 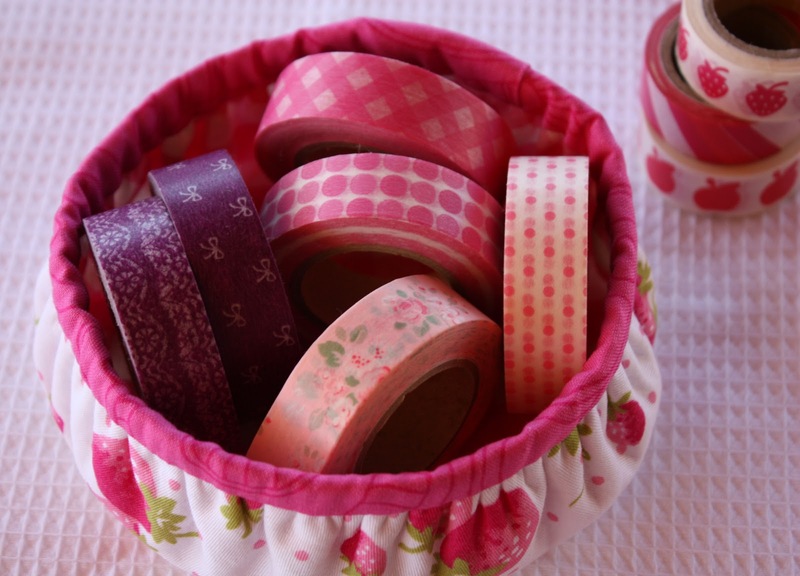 AND you own the matching washi tape with strawberries … Supercute! I have a feeling I will be making many of these this year! What a great little gift for any occasion. Thanks for the tutorial. Thanks for sharing! I was hoping you’d do a tutorial for that basket. It’s adorable. Thanks for sharing! I love this and think it will be put to use in my sewing area right away! Love the basket so fun for spring or Easter. Super cute…I was wondering myself! Thanks for the great tutorial. PS- Sarah, I love the new header. This basket is so adorable! I love how easy it is, so I can’t wait to make a couple for myself and a couple for gifts. Perfect for my sewing friends. Love the girlie fabric you used for the sample. Cool header! I could use a refresher for my blog too. THank you! I had been looking at the photo trying to figure it out! Thank you for the tutorial so I don’t have to strain my poor brain! Do you think that if I used an upholstery weight fabric I could skip the wadding? I’m making one today! Thanks for the great tutorial! The new header is so lovely, girls!! I love it! I have been to Paris and that is an adorable city! Romantic, charming!! This project is wonderful! So gorgeous!!! Be sure I will work on it!!! I love this basket! I needed a little thread catcher and I think this’ll be perfect:) So cute! ♥ so lovely! thanks for sharing. I had to make one today and placed a link in my blog. Love you new header! Thanks for the Gathered Round Basket tutorial!!! I am going to make one now! Again thanks for sharing! I can’t believe you put a tutorial together for this! I loved this little basket from the second I saw it and can’t wait to make one for myself. Thank you so much! I am also loving your new header. You and your daughter are so full of inspiration and talent. great tutorial, hopefully I will be making one today. Great tutorial. I think I could make this! This is gorgeous! I feel quite inspired to have a go myself! 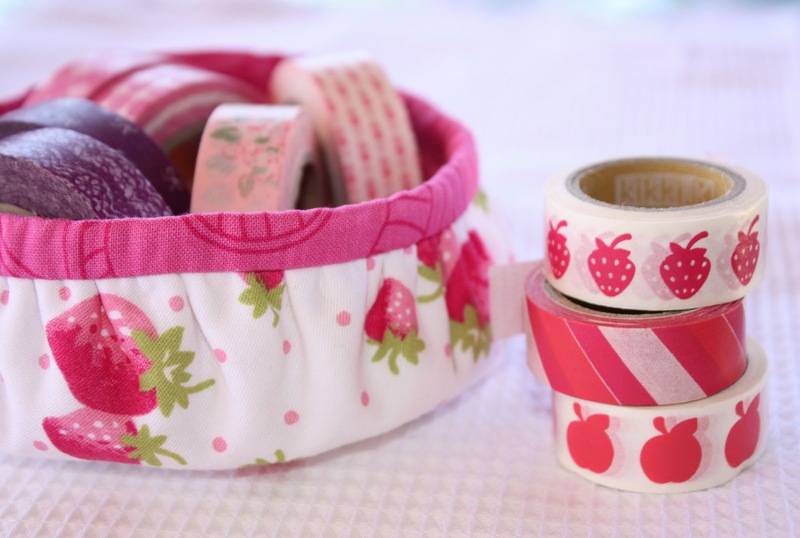 Would be a great organiser for my ribbons and embroidery threads, so much nicer than a carrier bag…. and another full of little sweets would be quite nice too…. I LOVE IT! Thanks so much for such a great tute…those materials you used are stunning too! And let Sarah know I think she is a very talented young lady with an incredibly bright future!! Loving the colour scheme and eiffel tower…matches her newly made over room!! It is on my list of things I want to make in the very near future! I LOVE this basket!! I want to try to make one! Wow it looks complicated to make at first, but you did such a great job showing how easy this can be done! Love this! Very sweet little basket! Thanks for sharing! I love the header! Great job Sarah! Love the basket and tried to make it but was confused with the directions of cutting a 8 inch circle. Was the 8 inch right? How does the 8 inch circle have a circumfrence of 12 inches? Sorry for being so dumb but I love this basket and want to make one. I love the “Living Creatively”! Love it! And might try adding a strap to make it an Easter basket. This is just adorable! Thank you for sharing. This is just what I’ve been looking for! Thanks for sharing your tutorial. Gorgeous! I’d love to share this tutorial on the Examiner’s Arts & Crafts page. Please le tme know if you are interested. Cheers! These are gorgeous, thank you so much for sharing! I found you through Pinterest and look forward to pouring over your blog! I just LOVE the look of this…..Oh, everyone I know is going to get such a cute little gift this year!!! Thank you so much for sharing such an amazing project!!!! Perfect! I want to make a couple of these for my daughter’s dorm room! Hey, I just hopped over to your website via StumbleUpon. Not somthing I would normally read, but I liked your thoughts none the much less. Thanks for making some thing worth reading. 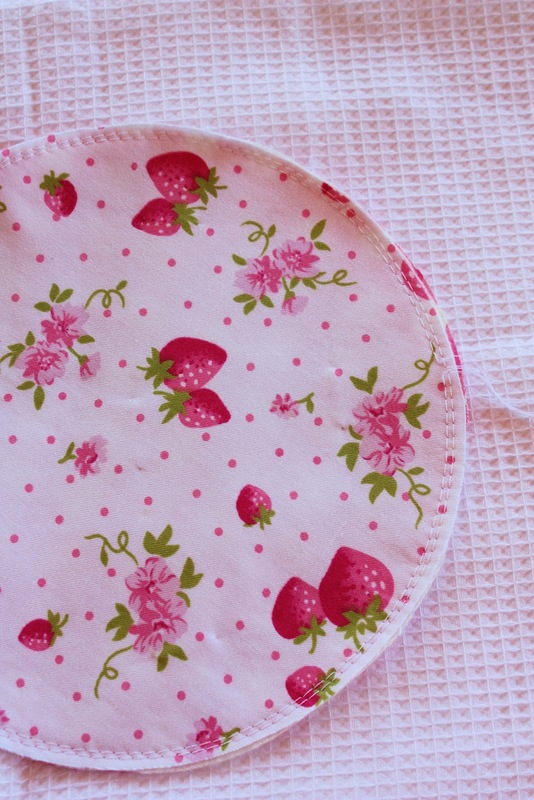 Love your great tutorial and yummy fabric choice! Who does not like it after coming upon a tutorial and say “hum, I could do that”? Well done. Adorei, muito lindo. Abraços ! This is so cute! Love how simple it is! THUD….that was my jaw falling on the floor. SO stinkin’ cute. TFS! Such a cute and EASY basket, thanks for sharing, I love it. This is great! The possibilities are boundless. Thank you. Thanks so much for a great tut Lisa!! I made one too, so easy, I love it :o). If the circles are 8″, how can you gather them into 12″? The circles are 8 inches in diameter (the measurement you get if you rule a line through the centre of the circle) and when they are gathered they measure 12 inches in circumference (ie all around the outside of the circle). Hope that helps. Looks too cute, thank you, I’ll definitely want to try this. Looks too cute; I’d love to try this. I’m confused. If you’re starting with 8″ circles, how can you even out the gathers to a 12″ circumference? cute & washable and you can collapse it. Visually, didn’t make sense. Thanks for clearing that up. Love this! I’m making several today. My nieces will adore these as catch-alls on their dressers and nightstands. Thank you! Hi, I am new and absolutely love this. Is this possible to make in a larger size? I thought I would try to make a large one, starting out with an eighteen inch circle. Are my calculations correct to gather the top to a 24 inch circumference? You have described the pattern so well, I feel it is very possible to make a larger one. Hi, I ‘ve never really commented before on sewing blogs.. but your project is so creative and simple that i couldn’t resist it! you’ve given a brilliant idea. Been wanting to make a basket but shying away. i guess i’d definitely do one of yours! thank you very much. I love to see your blog and your tutorials. 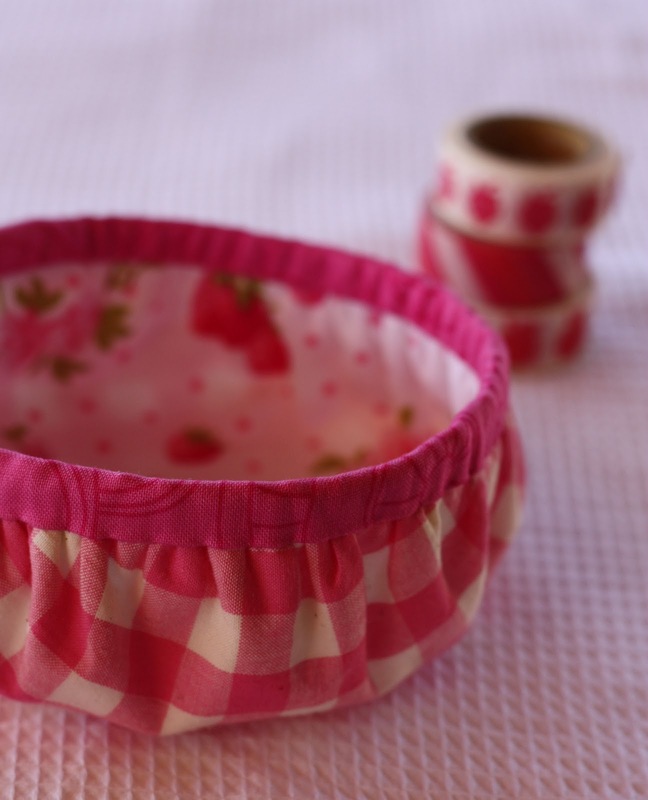 I would like to make different sizes of this lil’ basket as a set. Could you please send me the details for a 12″ & a 16″ in diameter baskets? 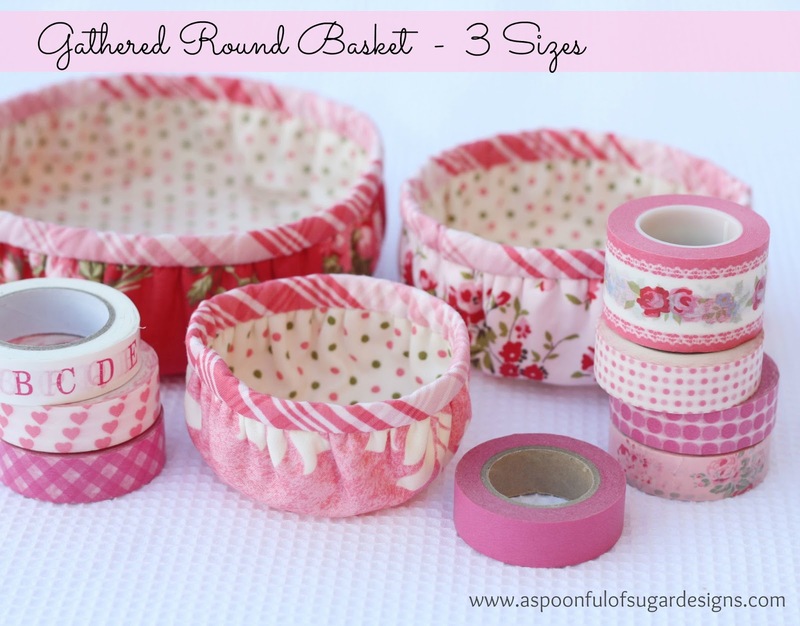 Hi Lisa and Sarah, I’ve featured your Gathered Round Fabric Basket today… Threading Your Way Features. This is a very pretty item for a gift. If I don’t have fusible batting/wadding, could I use regular wadding? I think the fusible type just keeps it from shifting as you sew. Perhaps I could just baste the regular kind in place to start with? Thanks. 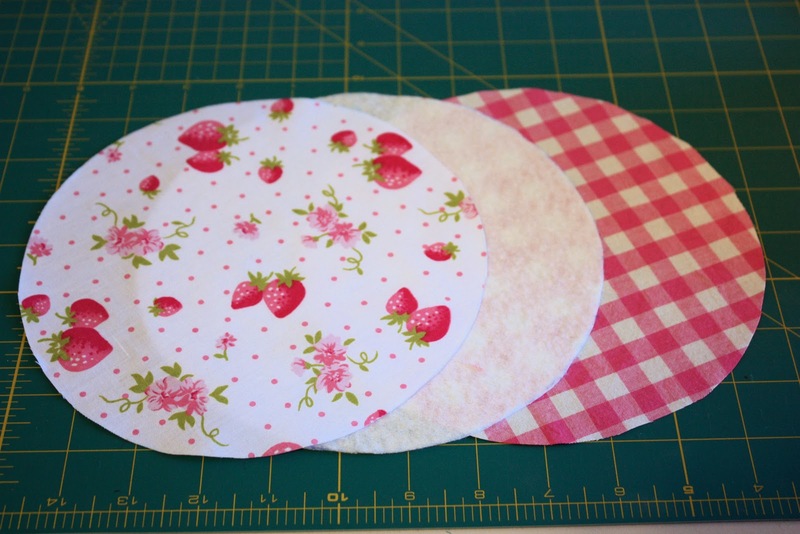 Could you use regular wadding instead of the fusible kind? I don’t have any fusible kind at home but was thinking about using the regular kind to make one of these. Jean – If you use regular wadding, use basting spray or baste the layers to hold it all together while it is being gathered. Hermosas estas cesticas, adecuadas para un obsequio. Muchas gracias por el tutorial, bien explicado. Beautiful little holder, especially after work rather than seeing we have our accessories lying around-this holder helps! Thanks for the tutorial and I have made the 3 sizes…… Thanks again…..!!!! These look soooooo very adorable! I was wondering where you got that pink floral washi taoe from? Would love to get my hands on it! It looked so cute that I had to make it. It’s really easy. But yours looks much better than mine. Hi. Really cute. Have you tried making larger ones? Would you run into problems with them keeping their shape/the sides staying upright do you think? Hi Linda – We haven’t tried making any bigger ones but it should work OK as long as they weren’t too big. Thanks Ofelya. Your baskets sound like they would be very sturdy. There are some great upholstery fabrics around. Love it and most certainly going to try to make some for me! Thank you! i may be a little dense, but i can’t find the tutorial for the postage stamp hot pad. they are so cute and i would like to make several. Is there an unfinished seam on the inside bottom….or did I miss something? To make this reversible, you would have to make two separate pieces and then sew them together around the top edge. Otherwise, if you sew both bottom circles together and then add the side piece….you end up with either a surged or unfinished edge on the inside. Am I correct? The picture looks like your inside basket is total finished with no seam allowance/unfinished edge showing. Hi Susan – there is no side pieces or seams. It is made by sewing two circles together, gathering the top edge, and then adding the binding to hide the gathering. Hope this helps! Thanks so much Carole! Sorry for the late response – I have been unwell and haven’t been able to check my emails. i really appreciate the feature.